Transformation of a garden in Taunton! 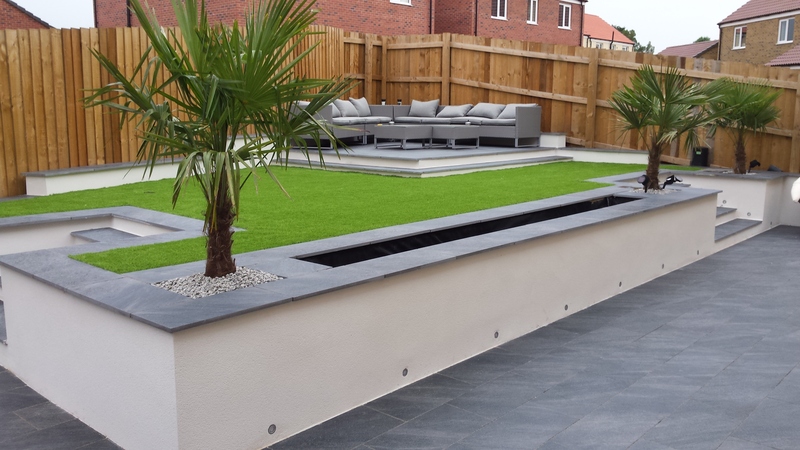 Once the garden was designed we agreed with our clients that as it was a big project we would work in stages, fitting it between other jobs so they could spread the cost and get exactly what they wanted. The preparation work was started with lots of clearing, digging and leveling going on. There was a lot of hard landscaping involved in this design. The foundations and footings were dug and set, so it was time to make a start on some of the brickwork and steps. It was great to see the garden taking shape and the different aspects all starting to come together. With the addition of the lighting, water feature and soft landscaping, the end result was totally amazing! This was achieved with just 2 guys working as and when, over a period of a few months. This made it possible to give our clients the exact garden they desired, both spreading the cost and keeping within their budget. Looks absolutely amazing, but isn't it difficult cutting the grass with all them steps? Thank you Karim we were very pleased with the result too. Beautiful, looks like it has a Mediterranean feel to it.